I love you all, but…please..please..do not use words that could imply impending doom when naming your projects. Could it be that I was jinxed from the start? I’m all in favor of living the life of strong and exciting women though our knitting. As strange as that sounds, I’m knitting a Boleyn Shawl right now, so obviously I’m on a theme here with female protagonists. But when I started Calamity Jane, I thought my struggle would be the lacy-ness of it. I was surprised when I found the lace challenging and fun (“fun” is not usually the word that follows “challenging” with my lace attempts) and was convinced I would make it through–especially with the great lace pointers I got through twitter and the blog post below. As I was knitting, I was innocently thinking that I had SO much yarn..I might make it bigger. 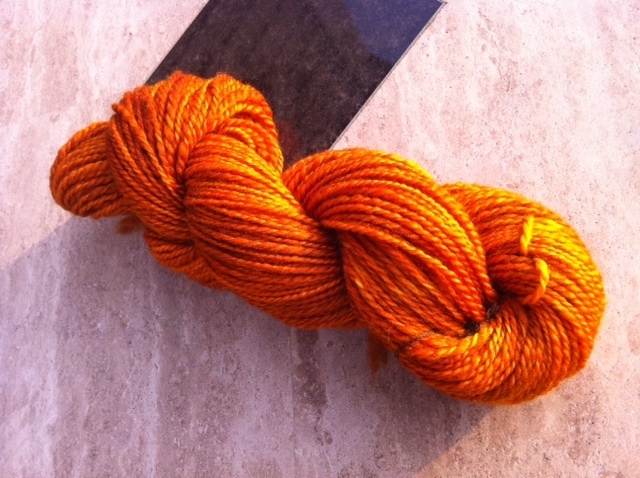 The yarn was my own handspun and dyed superwash BFL..4 oz, and everything was going swimmingly. Until I started the bottom border. Which I lOvEd. Great pattern and wonderful way to finish an awesome design. Until..about…1/3..of the way through and my remaining yarn supply was dwindling fast. So fast it was almost evaporating. I took this picture, but I couldn’t even blog about it, I was so distressed. There was NO way I was going to finish with the yarn I had left. I ordered more BFL and tried to dye it, but..yep..I’d used the last of the dye already and could not find that color again. I toyed with doing the border a slightly different (but intentional) hue. I procrastinated. I put words between “calamity” and “Jane” that would best not be repeated. I stared at it and thought it might suddenly seem possible to finish. I started Boleyn. I wove two scarves. I cleaned my bathroom. Nothing changed. So, last night, I frogged the border and finished it with a plain jane garter stitch trim. Will anyone ever notice? No. Is it still pretty? Yep. 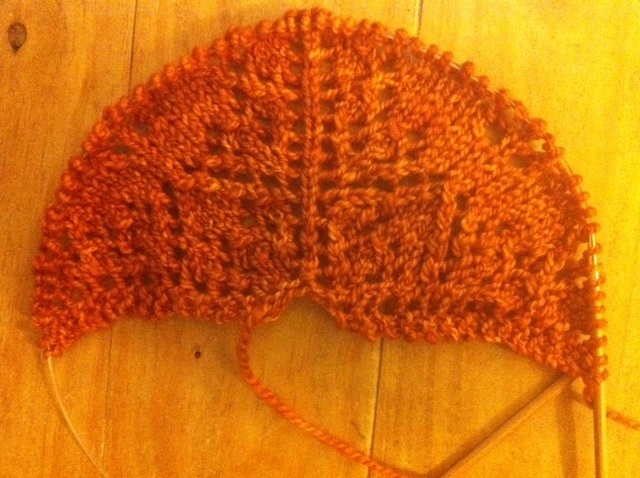 But I hereby resolve not to download another pattern that makes my instincts go on edge by the name. 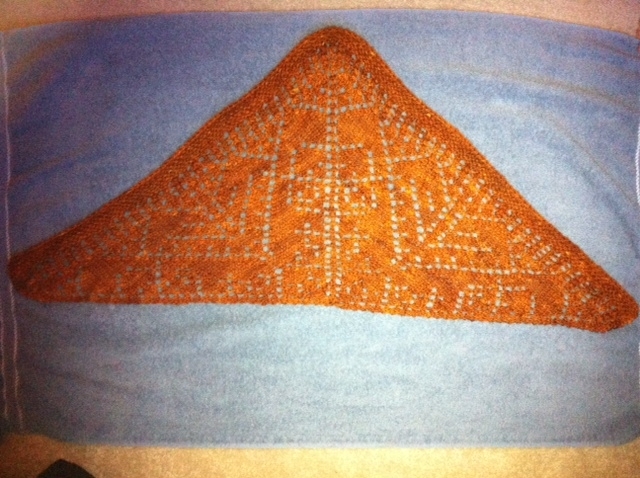 Blocking, happy, finished..but what a calamity! Help me keep loving this! At this very moment, I’m loving knitting lace. Goal of this post? To find ways to keep me in this happy place. 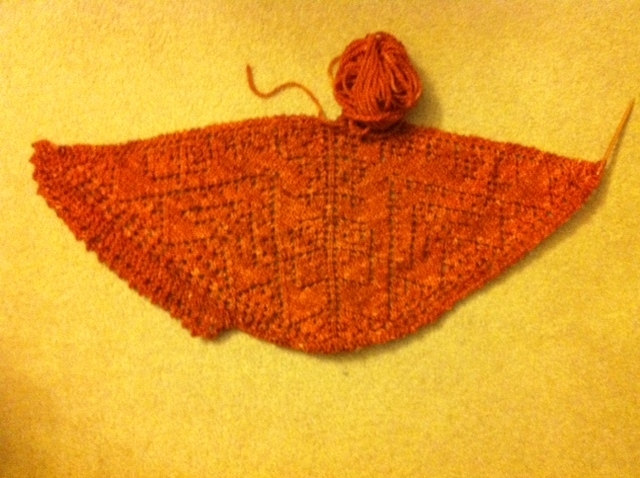 I’m knitting Calamity Jane and it’s (almost) my first lace project. About 7 years ago, as a relatively new knitter, I tackled Cozy and while it’s a beautiful pattern and I did finish it, it was only because I’m ridiculously stubborn and refuse to quite anything. In other words, the shawl was pretty, but I was not. I’m totally enjoying this new start at lace, and I really want to keep loving it. Through “cozy” I learned the value of lifelines and stitch markers. I remember how painful a skipped YO can be, and oyyyyy what it feels like to take out Sl1 K2tog PSSO stitches. Sorry. Got carried away. Here’s my request. Right now I’m doing a stitch count check halfway through each row and again at the end. That seems tedious but totally okay if it keeps me sane and happy. What other tips can you lace enabling people give me? It’s been a while since I fell into the “just one more row” fun/challenge side of knitting and I want to stay here!